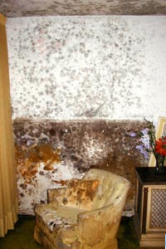 JPS Restoration and Construction does mold remediation, JPS also specializes in providing water damage repair services in Phoenix and all the surronding cities. Heavy growth of Stachybotrys Chartarum, and some other fungi on sheetrock can be seen and unseen. This growth occurred within days of the water damage. Don't take the health risk, call JPS asap! !